6-18-2013 Tell us how your reptiles are doing! Update us!! Hi everyone, We haven't heard from a lot of you recently, some new members have not posted at all... So lets hear about your pets and how they are doing.. such as temperament, health, caging/enclosures that you use etc. Tell us how you got started and where you expect to be in 5 years. Tell us what you have and what you would like! We are here to help you with any problems you might have but still love to hear your story! Is your pet always healthy??? We would like to know your secret! I have always had a passion about reptiles, actually i'm pretty animal crazy. I had the pleasure of having parents that supported my interest in reptiles. they allowed me to own a boa constrictor when I was 12 years old, that a neighbor was getting rid of, this was my first snake and a big boy, I learned so much caring for Juan I had that snake for 20 years, since than I have never been without a reptile, even though my passion is snakes, I do own a bearded dragon that is elderly now she is almost 10 years old. all of my snakes are just pets none of them have ever reproduced. every snake has there own personality, they are all very friendly, but some really seem to enjoy being held were I have a couple that are just fine with not being held. i'm fortunate my snakes are good eaters, as you own snakes they will eventually go off feed, if kept properly this usually will happen when they reach sexual maturity. I have never had a sick reptile, however I purchased a dwarf super tiger retic that came to me with mites, my very first and hopefully the last time I have ever had to deal with mites. I always quarantine a new snake so it actually wasn't too bad treating him. however I was not happy with the breeder, but that's another story. 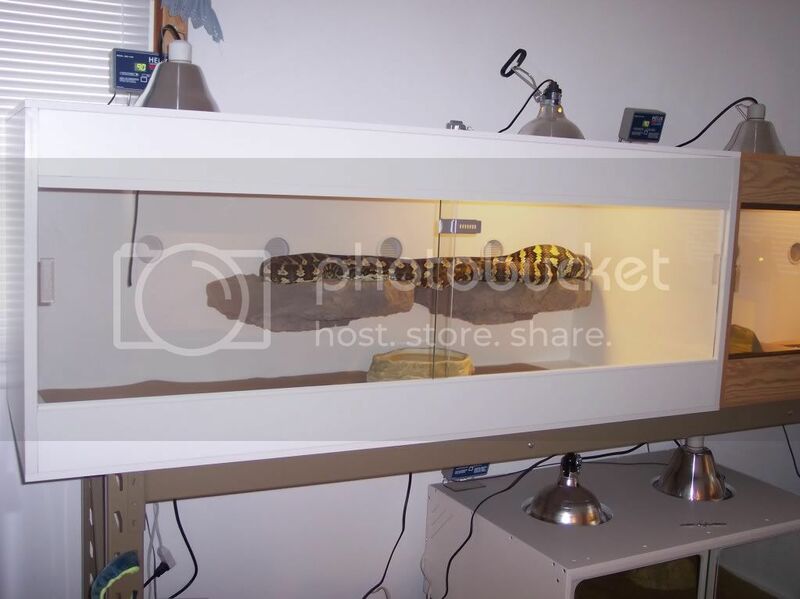 all my reptiles have there own cage and I use ceramic heating element to heat there cage this is plugged into a thermastate I cannot stress this enough you should own some kind of thermastate. I own helix brand, but any reliable theramstate will work just fine. I will post a pic of one of my cages to give you an idea to proper set up. Hey guys! I have a Columbian red-tailed boa named Lucy who has her very own unique personality. I've had her for a little over 4 years now. Fortunately she has never been sick, but I have had to deal with mites (hopefully never again). I'm pretty sure they came in from her bedding, so I just make sure to spray it with a lice/tick stuff from the pet store used for fur animals. If you spray it only on the bedding and NOT the reptile, and then just let it sit for a few minutes to air out, it's safe they told me. Been using it for awhile now and no issues. I have her in a tank with the ceramic heaters on top (never really cared for the bottom/side stick heater pads). They didn't seem to keep it warm enough and I was worried about burns. I still have a problem trying to keep it moist enough in there for her though. Shedding can be a little of an issue, but she lets me help her with no problems. And she's on a pooping schedule, pretty much. I keep a little journal with just her information on it: feeding days; doctor number/address; pooping days; shedding days and how long; cage cleaning schedule. Also a few medical things to look for and different things I've tried/changed in her environment and her responses. She likes to be held by pretty much anyone, except when she gets in her moods. Which she lets me know by blowing out her nose as if she is annoyed and moving away from me (kinda like if she had shoulders and pulled away, lol). Just a little up date on everyone. For the most part all my kids are doing well, I have everyone in a while. but it Micky that I'm worried about! The last time he eat was at the end of oct.. and it now almost the end of June!!!! and I've tried everything, and I don't went to force feed him, but I'm about ready to!!! what do you guys thing?? Nikki, we have seen this many times... Raptor667 just went through this as well. Check through other posts here on the site. Not much you can do, I'm not much of a force feeding kind a guy. Micky will eat when he is ready! Pythons seen to like to make you worry! Last edited by NASAAN101; 06-27-2013 at 12:11 AM.